Livestar first launched at TechCrunch Disrupt a few months ago. It’s a mobile app that lets you see (and write) reviews for the things you generally want reviews for – restaurants, movies, music and other apps. The company was founded by former Microsoft M&A exec Fritz Lanman. The reason you want Livestar on your phone and use it every day is it combines normal user reviews (like we’ve grown accustomed to on Yelp) with professional critics. You don’t have to scour the Internet for those professional restaurant reviews. Use Livestar to pull up local restaurants and present those reviews for you. Same with music and movies. You can do it all with one app. Livestar was pretty useful when it launched, but a lot of key features were left out. Those features are in there now. There are now 200,000 professional critic reviews. 875,000 total reviews. And when you find what you want, Livestar helps you get it. Click to reserve a table at the restaurant with OpenTable. Or add songs to your Spotify and Rdio playlists. Get theater movie tickets from Fandango. And best of all, add older movies directly to your Netflix queue. All of these service integrations are new with the new version. And soon third-party developers will be able to access Livestar data for their own apps. If you’re constantly opening Yelp, IMDB and other apps on your phone like I am, try this out. You may like it. 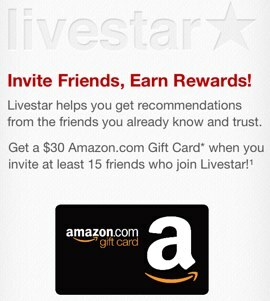 You can also easily get a $30 Amazon Gift Card for trying out Livestar. If you can get at least 15 friends to accept invites and try the app, you’ll get the card. Directly paying users to invite their friends is a time-honored way to (a) spend a lot of money fast, and (b) if the service is good, get very fast and sticky distribution. PayPal famously did this over a decade ago, paying users $10 for every new user they referred. Suddenly, every single person I knew in Silicon Valley was beaming money back and forth on their Palm Vs. Since PayPal was actually really useful, the crazy scheme worked. Livestar is doing something similar, although a little less crazy. Instead of a flat cash payment they’re giving away Amazon gift cards. And instead of $10 per new user, it’s $2 per new user, with a $30 cap. “How do your investors feel about this?” I asked. Disclosure: I have no direct or indirect financial interest in Livestar. See here for my full disclosure policy.